Are you attracted to living in Quaker Community? Want to be a volunteer and stay here for a short time? Solar Array – sustainable energy project. Actual military spending from the 2018 budget increased to a record total of $3,755,683,000. 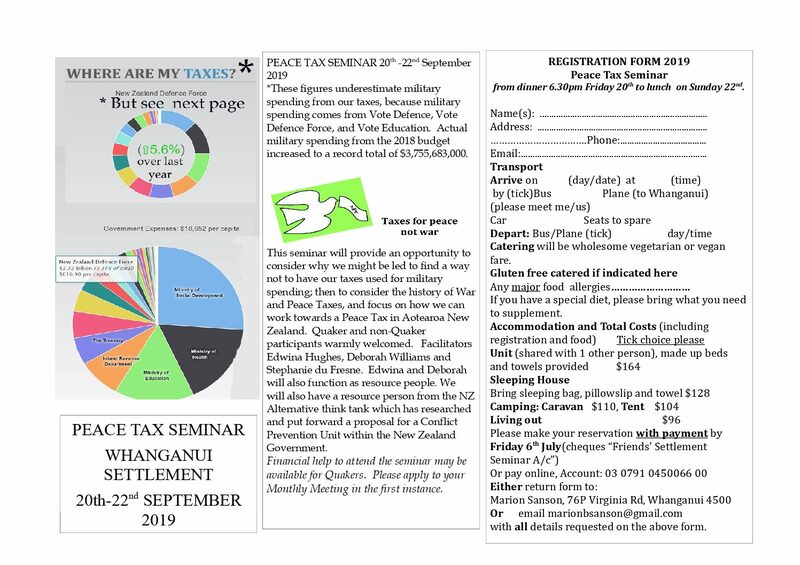 This seminar will provide an opportunity to consider why we might be led to find a way not to have our taxes used for military spending; then to consider the history of War and Peace Taxes, and focus on how we can work towards a Peace Tax in Aotearoa New Zealand. Quaker and non-Quaker participants warmly welcomed. Facilitators Edwina Hughes, Deborah Williams and Stephanie du Fresne. Edwina and Deborah will also function as resource people. We will also have a resource person from the NZ Alternative think tank which has researched and put forward a proposal for a Conflict Prevention Unit within the New Zealand Government.